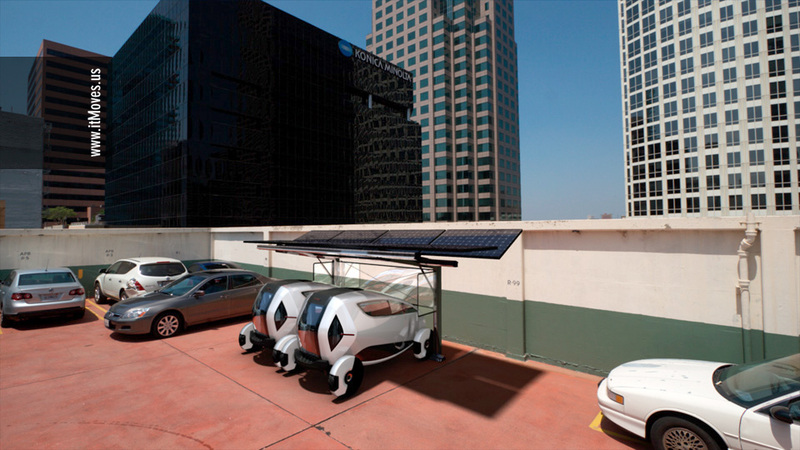 The original idea behind itMoves was to develop a vehicle (ME) and parking station (4.ME) and to offer them to existing car-sharing organizations. It was Mark Goodstein's arrival, along with the first serious contacts with local investors that helped define a more ambitious yet more attractive vision: what if we went all the way and provide a complete mobility package? After all, we were already taking on the most difficult job (to develop the vehicle). And if we go all the way, why not picking Los Angeles as the city to launch? After all, if we could make it in LA, we could make it anywhere. itMoves is the first truly sustainable automotive services company: its cars will be built, serviced, and replaced in the metro areas they’re driven in and rented directly to consumers on demand, providing cities and consumers alike a sustainable solution to urban mobility, parking, and congestion. itMoves will deploy its iconic charging stations and highway safe single-person EVs in busy city locations, where its four-to-a-spot vehicles will be waiting to be rented by the minute by consumers. We will launch in LA, creating 100+ jobs locally, and once the system is perfected, expand worldwide. If one believes that the future of mobility in dense urban cores is electric (and there are many good reasons to support this), offering mobility on demand is perhaps the only economically sustainable business case for deploying electric vehicles. A critical mass of vehicles in a metropolitan area will free people of the costs of car ownership, allowing them to rely on the wide availability of our cars for their on-demand use. Each vehicle will replace several personal vehicles, easing congestion in the city. What constitutes critical mass? 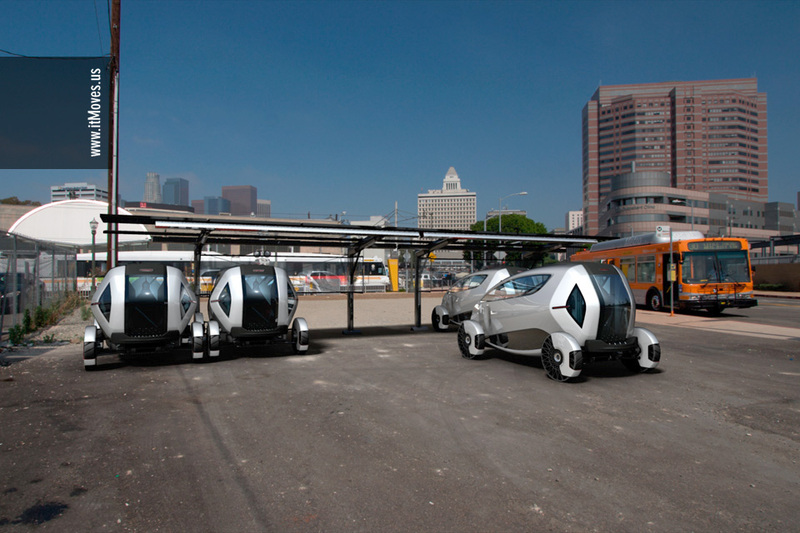 We envision the Greater Los Angeles requiring anywhere betwen 9,000 and 11,000 vehicles. The cost barrier to acquiring a customer will be low (a trial for the price of lunch vs. the inertial barrier of convincing them to buy the car) and the ubiquity of the vehicle in dense areas will allow us unparalleled marketing ability (everybody will be aware of the vehicle because they will see them and also their charging station parking spaces every day). We were asked several times why couldn't we just buy 1000 Smart cars and test the business model, and it will not be fisible. The reason? Existing vehicles do not have the characteristics we require (size, powertrain, safety, cost, etc.) to enable us to achieve the level of vehicle density required for critical mass. Only two Smart ForTwo fit in a standard parking space. Considering the high cost of the EV version, we end up with half the revenue while doubling the cost, effectibly killing the business model. Greater Los Angeles is home to 12.2 million people. Despite its image as a collection of suburbs, LA has several areas where EV sharing can be implemented. But the system should be ambitious enough that covers the whole region, so that people can shuttle back and forth in between these communities, with the areas connected as a regional system. Precisely because the distances are big, Greater LA can not rely on transit alone, no matter how many lines are built. The current solution however, relying in almost empty vehicles, will only be more and more unsustainable, not just from an environmental point of view but as a whole. Downtown LA, with its thriving young community and still relevant government and corporate jobs. Hollywood (plus the City of West Hollywood). Koreatown, one of the densest neighborhoods in the country. We cannot forget both USC and UCLA campuses; Greater LA is home to some 200 higher education entities who teach about 1 million students. Lastly, LAX remains an embarrassment for its lack of effective transit connections. Our one-way EV system would greatly improve the current offering, adding a clean, personal and more flexible alternative to shuttles and taxis at a fraction of the cost for both costumer and city. In adition to street parking, the metro area (specially downtown) is full of sparsely used parking lots (both at street and roof level), most of them receiving sunlight 325 days a year. Here again, the small footprint allows for an easy deployment and great flexibility to find the right location (both for itMoves and the parking operator). About 40% of the population in the greater Los Angeles lives in multi-unit buildings. Some cities like Pasadena are encouraging developers to offer car-sharing as part of their amenities. In Los Angeles, there are 71 planned or built Transit Oriented Developments, where car ownership is not crucial yet occasional access to a car is still needed. From my window I can see American Apparel original factory. Here is a company that decided, when globalization was gaining full force, that they could not only launch but prosper by producing white T-shirts in Los Angeles. They trusted that people would be willing to pay a little more for an idea (and lots of attitude). And it worked. Traditional car manufacturing cannot return to LA, for lot of reasons including environmental regulations. But we are not talking big, integrated auto here; we are talking local assembly (without paint booths, let's don't forget) which will still generate 100+ jobs, in addition to the service jobs. The operation would be profitable on its own while also providing cities with additional revenues (parking fees at the very least) that we would share with them. Up and running as a self-sustained, local enterprise, the vertically integrated system can spread throughout the world following a franchise model. After creating the car dependent future 60 years ago, wouldn't it be fantastic for the Car Culture Capital of the World to export its antidote for the XXI century?